Needles and Hooks and Books, Oh My! : Some New Books and some FOs! 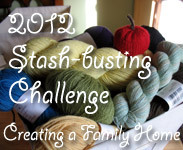 For Finished-Object Friday over at Tami's Amis, I have 2 things to share. I finished blocking my cabled cowl, and got the buttons sewn on. I noticed a little mistake when blocking, but I hope no one else does! I also finished my crocheted button cowl, but have decided against making a set. 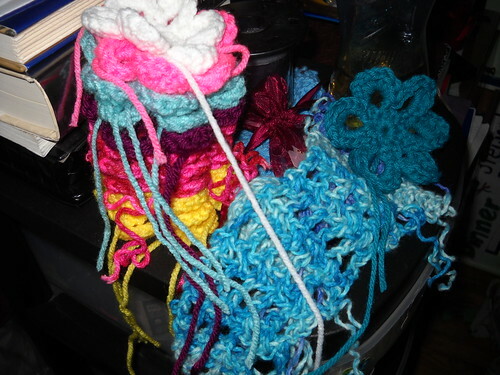 I also have a huge stack of crocheted flowers that will go onto hair elastics or headbands in the near future. 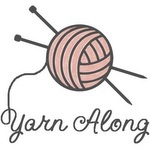 Can't wait to see the cabled cowl! Love the look of the crocheted flowers - perfect Spring hair accessories! I'm also terrible about reading too many things at once---I have like, four books in bed with me right now, one of which I just took out of the library this afternoon. Sadly, I can't offer a recommendation (or otherwise) re: Laurie King, as I've never read anything of hers. I will, however, admit that while I'm not a Hunger Games fan, they do read at lightning speed, so hopefully you'll be able to finish Catching Fire in time for Mockingjay's arrival on the hold shelf.